Well the Farmers Almanac has been proven right again. It said to expect a lot of precipitation in the early months of winter, and wow were they not kidding. We’ve had so much snow this year! Also, don’t mistake that exclamation point for excitement, that is pure frustration. Any snow after Christmas is not welcome in my neighborhood :) I’m thinking I need to take up more winter sports. Does anyone have snowshoes I can borrow? My cookie tutorial today is very fitting for those of us who have been buried under snow for the last few months. It’s a snowy tree how-to and a simple one at that. Enjoy! 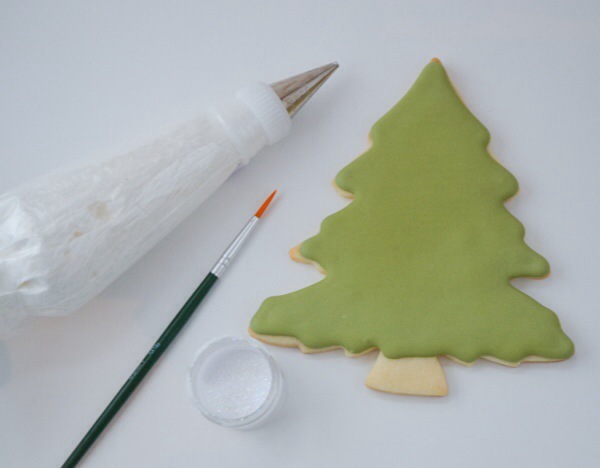 You’ll want to outline and flood your cookie with a #3 piping tip and green icing first. Let that dry for at least 3 hours before continuing on to the next steps. Once it’s dried, take your stiff white icing with the #3 tip and add snow wherever you’d like. Practice on parchment first to get the look you want. Once you think you have it, translate that onto your cookie. You’ll immediately want to get your edible glitter and a dry brush to work on the next step. You don’t want your stiff icing to dry! Dip your dry brush into the glitter, place it directly above the white snow and tap the brush to release the ‘snow’. You’ll get a shimmery result that looks like glistening snow! 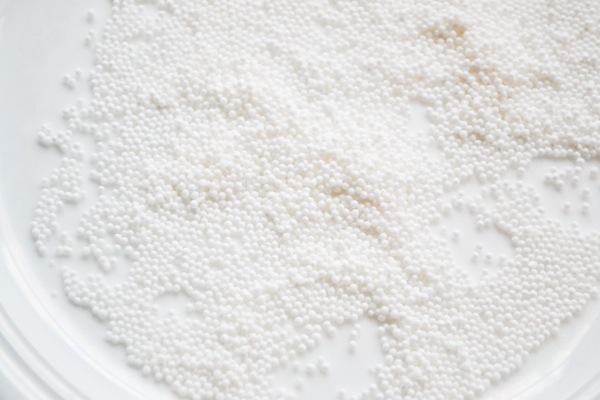 I added in a few variations of snow by using white nonpareils as well as white sanding sugar. Good luck with your trees! I realize this post is a little late, but I figured if I got this published before the holidays officially ended that you all would forgive me. I have a quick tutorial on doves for you all. 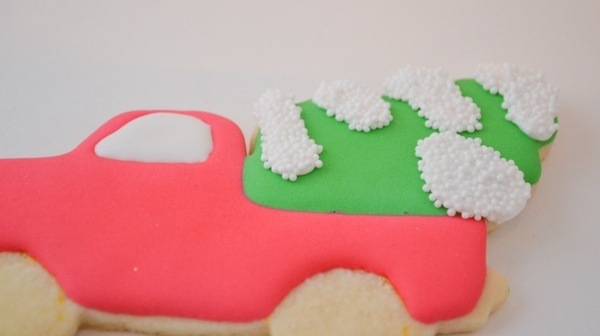 They are simple to execute so if you’re looking to dip your toe into the world of cookie decorating, this tutorial might be the best one to do it for. 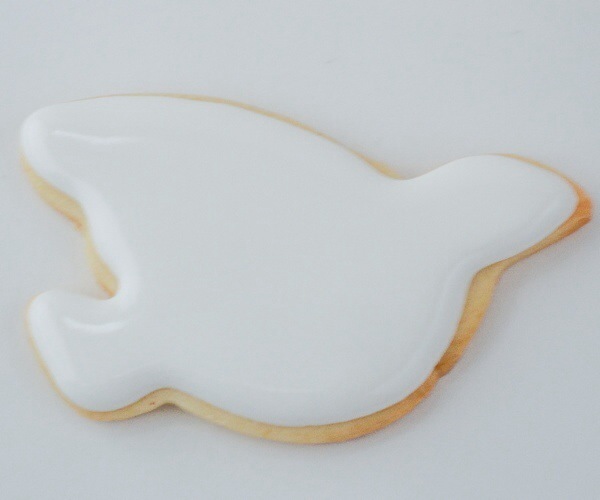 You will start out by outlining and flooding the cookie in white royal icing using your #3 piping tip. Let that dry for a few hours. 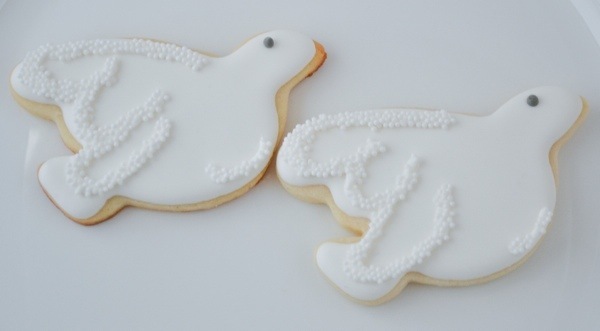 Next, you’ll take your stiff white icing fitted with a #2 tip and outline the wings. Immediately dip the cookie into the nonpareils. Lastly take your grey icing with a #1 tip and add in the eyes. 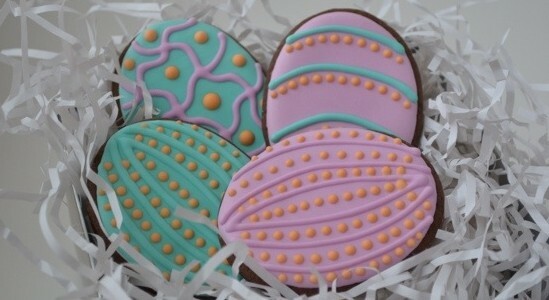 That’s all you have to do to make these adorable cookies. Enjoy! I hope everyone had a great Christmas. For the first time in years we received a lot of snow in our neck of the woods so it was a nice way to get in the holiday spirit. 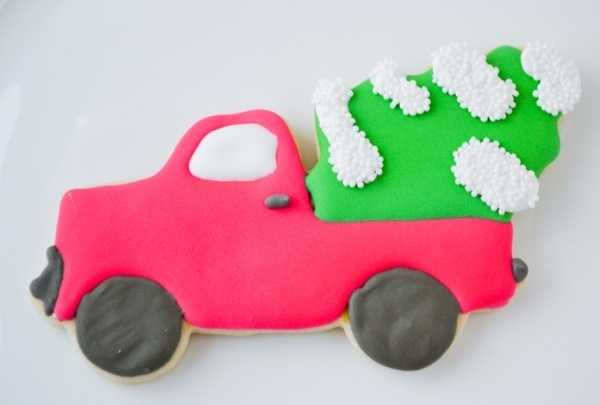 Seeing as I was either shoveling or decorating cookies in the weeks leading up to the holidays, I have lots of fun upcoming cookie tutorials so get ready! 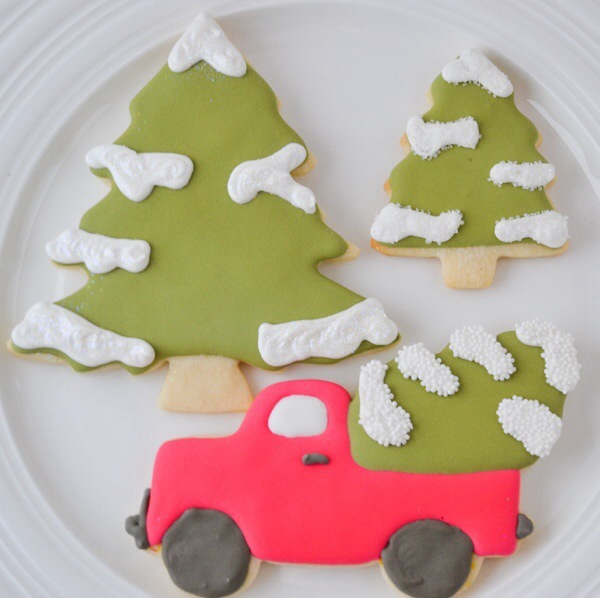 First one up is a pick up truck with a tree. I found this a few months back and knew it would have to be a tutorial. Enjoy! 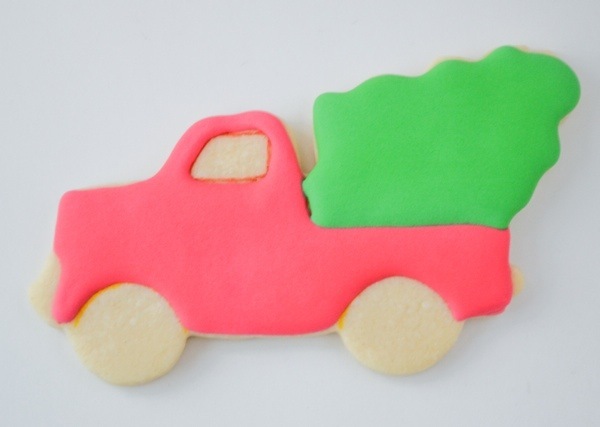 First you’ll want to take your food marker and outline the shape of the truck as well as the round shape of the wheels and truck window. 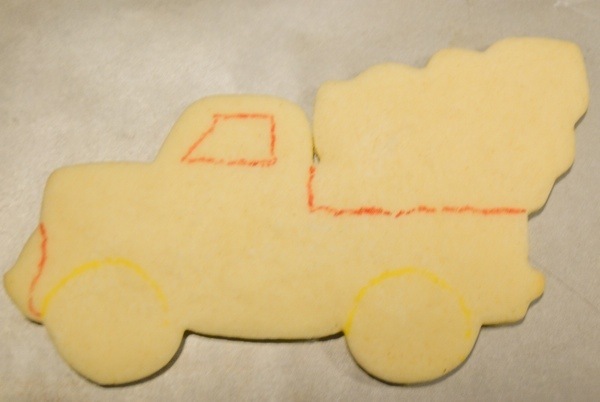 Next, you’ll take your red 20 second icing with a #3 tip and outline and flood the truck. Let that dry for at least 2 hours. 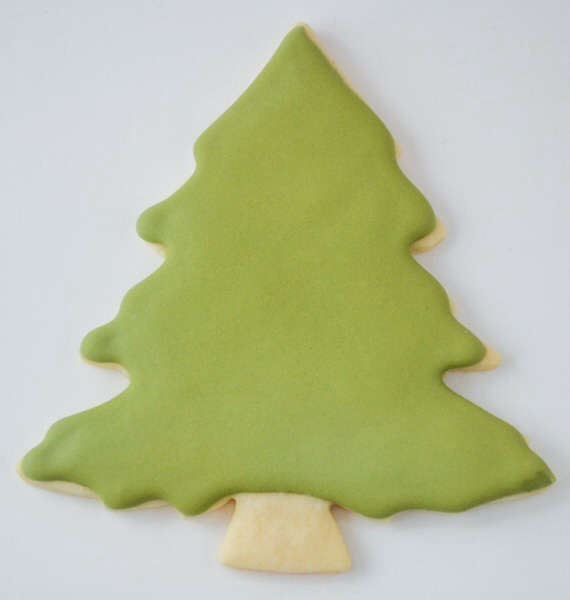 Come back with your green 20 second icing and #3 tip and fill in the tree area. Let that dry overnight. 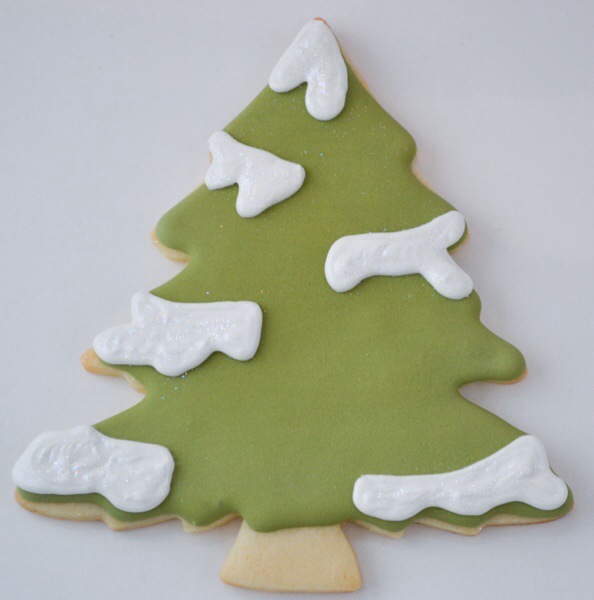 The next day you’ll take your stiff white icing with a #3 tip and draw snow onto the tree. While the icing is still wet, dip your cookie into the nonpareils and the result will be a really cool texture to the cookie! Lastly fill in the remaining details of the wheels, front and rear bumper and door handle with your grey icing outfitted with a #2 tip. 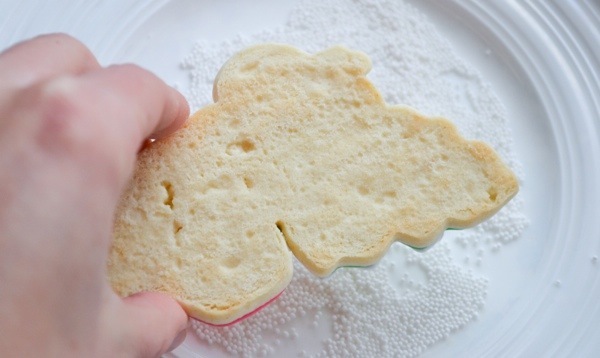 Make sure to use the white icing to fill in the window as well. That’s it! Super easy with adorable results!